The stars are right! First people complaining about vampires becoming My Little Pony surrogates. Then Berin mentions the conjunction of Talk Like A Pirate Day and Worldwide D&D Day. Rather than do an entire blog post in pirate-speak I thought 'vampires/pirates/D&D'. Three great tastes and you can guess the rest... The night-time depredations of the Blood Tide made the free port of Blacksands wealthy but their relationship with the town is that of a rabid attack dog and it's unsavoury owner. The other pirates know "...the Blood Tide crew be 'touched' by the dark..." and keep their 'friends' closer. Though the pirates "fear no man if he's got gold!" they respect the Blood Tide, it's crew and the sharks that swim in it's bloody wake. 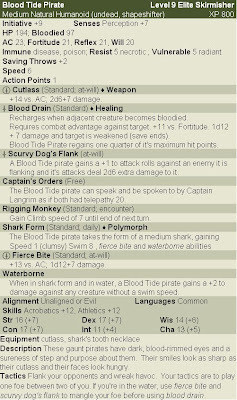 These pirates serve aboard the Blood Tide, a pirate ship known for it's evil reputation and crew's adoration of bloody violence - the pirates carry out night raids on coastal towns that strike fear into those communities and then sail into free ports like Blacksands to sell their ill-gotten booty. Those who know of the Blood Tide often make conspicuous signs of faith or utter a prayer to be kept safe from them. Dark whispers of those who join the Blood Tide having to kill someone by drinking blood from a cup lined with shark's teeth are circulated by the credulous - the truth is worse. Each is a seasoned cut-throat, skilled at flanking a foe and slashing them open with a swift cutlass blow and somehow always aware of what their captain wants. The tales of drinking blood from the open wounds of their enemies, sharpened teeth and willingness to throw victims to sharks makes them unpleasant company. At least one pirate has compared drinking with them with "...drinkin' wi' sharks who got legs - at least ye can trust a shark!" That said, the Blood Tide has notably worked well with other pirates, even though some 'differences of opinion wash the timbers in blood' to the benefit of all parties. Their ability to shapechange into a shark is a secret though some sailors have reported that Blood Tide pirates have leapt off one side of a beleagured ship to vanish into shark-infested waters to reappear on the other side of the boat without a scratch and looking haler than when they jumped. It also allows them to scout out a port or quay without the Blood Tide risking attack from the land. Such exploration happens at night when the Blood Tide pirate can avoid notice and when night-lights are dimmed. Next week: The fearsome Captain Langrim and the story of the Blood Tide. Oh you rock! A pirate monster for talk like a pirate day. Thanks for the feedback. And on Saturday, you get to meet the Captain!